I didn't know these guys even existed until the other day. 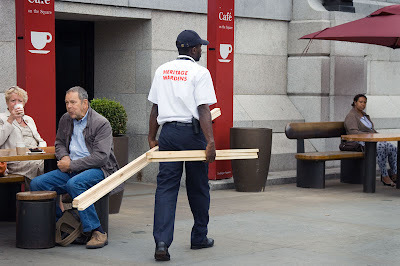 However Heritage Wardens have been keeping us safe in Trafalgar Square since 2000. Apparently. Never seem them around either. They probably keep hidden most of the times! Ciao. A. Are they like Mall Cops? Interesting to see him keeping the coffee drinkers in-line. What exactly do they do? He looks very official but what is he carrying? What's he doing with two planks of wood? Looks like he's an odd-job man! I've never seen them at the Square as well. Perhaps they should be donning those neon yellow overalls as well. Hmm, will keep a lookout for them the next time round.